from the travel-quest specialist travel directory. Polo holidays with on-site accommodation in luxury log cabins set in 110 acres of beautiful countryside. All holidays include full polo tuition with qualified instructors; horses and equipment provided. Suitable for all levels from experienced player to complete beginner. Polo training and holidays based on a working polo farm on the North Island of New Zealand. Offering inclusive packages made up of training, chukkas, B&B accommodation, activities and sightseeing. Polo holidays and courses; tuition on a per day basis or three day course available. Argentinean polo school offering polo packages that include stick and ball sessions and evening chukkas. Established UK polo school offering polo holidays worldwide, in particular polo holidays in Argentina, Dubai, the Caribbean, Chile, Australia, New Zealand, South Africa and Spain. Polo vacations and polo school offering specialised training and polo clinics for smaller groups or individuals. Dubai polo holiday – a three-day polo bootcamp course, season running from October to April at the Dubai Polo and Equestrian Club. 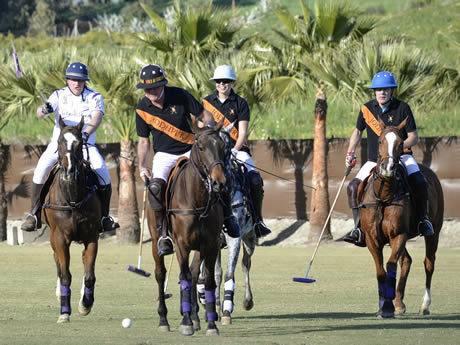 Also polo holidays to various worldwide locations including Argentina, Spain, Holland, Chile, Mexico and the UK. The travel-quest polo holidays and vacations section lists holidays, vacations, weekends and short breaks centred around the game of polo. It includes trips to polo games, fixtures, matches and polo hospitality events; as well as polo training, residential courses, bootcamps and holiday packages. This covers both field and arena polo. These holidays can be anywhere in the world, but in particular in Argentina, the undisputed center of the polo world. Travel-Quest will primarily list conventional horseback polo activities, but we will also consider other types of the game if offered as a holiday package, including urban, elephant-back, bike, water and beach variants. Learn to play polo as a day activity before committing to a longer holiday or course. A variety of options are available including: Learn Polo: beginners polo lessons in Hampshire; An Introduction to Polo: in York; and lots of general riding course is you just want to brush up those skills. The travel-quest polo holidays and vacations section lists holidays and courses offering polo coaching, play or match trips. See the definition at further up the page for more details.